CAMK2D is involved in the regulation of Ca2+ homeostatis and excitation-contraction coupling (ECC) in heart by targeting ion channels, transporters and accessory proteins involved in Ca2+ influx into the myocyte, Ca2+ release from the sarcoplasmic reticulum (SR), SR Ca2+ uptake and Na+ and K+ channel transport. CAMK2D targets also transcription factors and signaling molecules to regulate heart function. In its activated form, is involved in the pathogenesis of dilated cardiomyopathy and heart failure. CAMK2D is expressed in cardiac muscle and skeletal muscle. 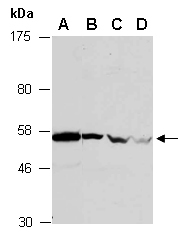 Rabbit polyclonal antibodies were produced by immunizing animals with a GST-fusion protein containing the C-terminal region of human CAMK2D. Antibodies were purified by affinity purification using immunogen. (C2) (R1403-2) at RT for 2 h.